The first day of spring has come and gone so it is officially time to break out the pastel colored clothing! The pretty pinks, soft lilac, baby blues, pale yellows, and mint green are the colors that will take over your wardrobe for the next couple of months. Last year we were introduced to millennial pink and we all fell hard for it. I own way more pink clothing pieces right now than I ever had in my life. Now it’s time to add some more colors to the mix. We are already seeing lilac and lavender hit the stores because of the color of the year, but now that spring is officially here, more and more stores have racks of pastel colored items for us to buy! After spending the last couple of months in blacks, blues, reds, and other dark tone colors, it is a nice change to add lighter and fresher colors into my wardrobe. The popular tops that I am seeing in every store are the front tie tops that have a knot at the bottom of the shirt. Pairing that shirt with some light-wash skinny jeans and a pair of mules or flats is the perfect spring uniform outfit. One trend that personally took me awhile to come around to was pastel colored jeans. I was always told that lighter color jeans make your legs look wider. (Thanks to Stacy and Clinton from What Not To Wear) But, this season Old Navy has started selling some really cute jeans that come in a variety of different colors. I bought the pink pair that is the flay lay picture above. 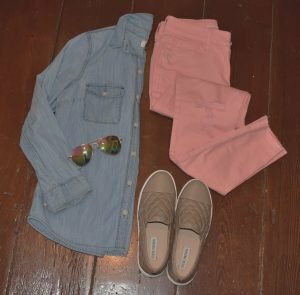 These jeans are such an easy way to add pastel colors into your wardrobe. Pair them with a white tank and a jeans jacket and you are ready to spring! Accessories are very often overlooked when people are buying new trends for the season. Ironically they are also the EASIEST way to add color to your outfit. Jewelry, scarves, sunglasses, and bags are a great way to add color to your look without spending a lot of money. Simply by adding a baby blue bag and some pink earrings to an outfit, shows that you are ready for spring! My personal favorite this season is pastel color mules or slides. They are so incredibly easy and comfortable to wear all day long and they pretty much come in every color so they can match whatever you wear! 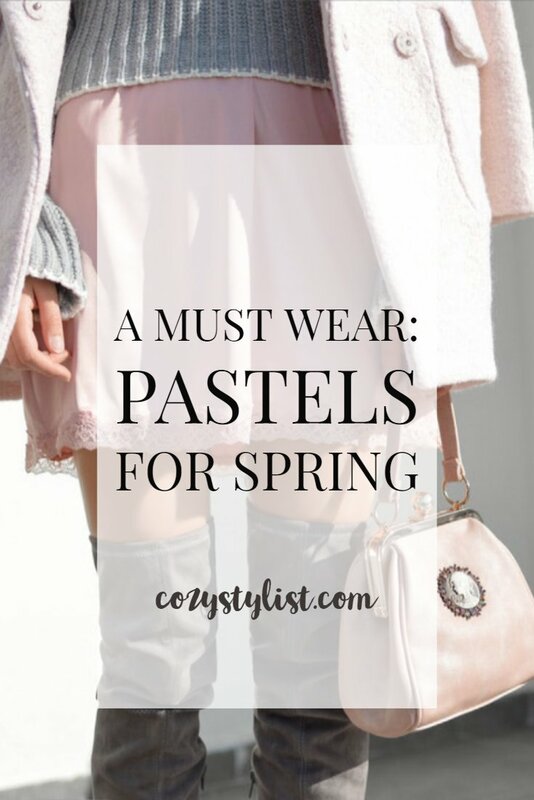 The beauty of buying these pastel colors items and having them in your closet is, that you know year after year you will be able to wear them. I truly don’t see the pastel trend ever going out of style for spring so you can keep them for while! So go out right now and get yourself some colorful earrings, scarves, and pants and have fun mixing and matching them all spring long! I love the pastel colours you listed – pink is my favourite. Just one more reason I love Spring! I love the look of the Lea+Viola pleated midi-skirt (it’s the pleats and the pink I love, not so much the skirt length) and the Charles Henry light blue off-shoulder Woven A-Line dress. 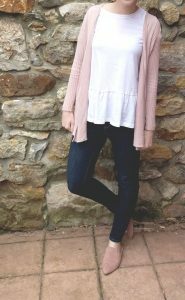 I also love the OOTD you were wearing in the outfit photo above featuring the white peplum top, pink cardigan and dark blue denim jeans! I think I’m starting to feel an online blouse-shopping binge coming on. Yes! It’s always a great feeling when you can finally break out your fun colored clothing after wearing nothing but black and grey all winter long. Thank you so much for subscribing! I will have to check out your cats Instagram page, I love cats so much! I am absolutely loving and looking forward to spring and the pastel colors that come with its fashion. I love the look of pastels and I just bought some pink shoes that I can’t wait to wear! Pastel colors are the best for spring! yay for new shoes! LOVE the colors! I think the Kate Spade bag might be my new spring bag! Just lovely. That bag is one of my favorites, love Kate Spade so much! As soon as I read wednesday and seen the pink jumper, I instantly thought of on Wednesday’s we wear pink – good old mean girls! hahaha I love it! I didn’t even mean to do that but yes! I love quoting Mean Girls! I love pastel pants too! Thanks so much! I used to love what not to wear! I wonder what ever became of them. Also what a test to see how fashion rules change! I am also looking forward to wearing pastel colors especially pink! I also want to add some lavender and lilac pieces to my wardrobe. I love the items you showcased on the blog especially the coral scarf! I love mint green! I prefer to wear pops of pastels rather than a whole outfit but I do love the cardigan in your outfit post. Thank you for sharing! The pastel colors are perfect. Gorgeous for spring. I’m not usually a fan of pink but I LOVE this shade! It’s so soft and gentle!! !